Radhanath Swami’s spiritual memoir is a model of modesty and candidness. He tells his story with remarkable honesty—the temptations of the 1970s, his doubts, hopes, and disappointments, the cultural shock and the friendships found and lost. His path is that of an ordinary American from the suburbs of Chicago, born Richard Slavin in a secular Jewish family in the 1950s, who goes on a spiritual quest to give meaning to his life. Less ordinary is his journey—literally, through Europe, the Middle East, and Asia, and spiritually, trying out various religious practices and studying with guides of different faiths, before settling in India. Add a zest of danger, suspense, and surprises, and Radhanath Swami’s story is a deep, genuine memoir that reads like a novel. His style reflects the humanity, kindness, and compassion that he developed after meeting a guru in India and joining the Hare Krishna movement, where he found his spiritual home. This book is accessible, effective and offers a mine of information about the quest of so many young Americans in the 1970s, about the city of Calcutta that is so rich spiritually, so poor economically, and about the Hare Krishna movement and its evolution to this day. 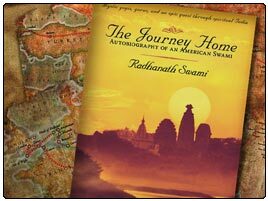 Other readers will be moved by Radhanath Swami’s spiritual saga, and will find echoes of their own quest in his journey. I liked such honest comments on the honest revealations by Radhanath Swami Maharaj in his book. Really the book by Radhanath Swami Maharaj gives a direction of our own quest in the life. Here is a candid review of a candid book. well said.. I also read Journey Home by Radhanath Swami and found same thing. This is a masterpiece from Radhanath Swami, and I echo the views of Bridgette expressed here. There is no doubt that Radhanath Swami’s book is mind boggling and provides inspiration to everyone who reads this book. Very beautifully said, “will find echoes of their own quest in his journey”. What an beautiful and complete description of Radhanath Swami Maharajas experiences. It is the most beautifully described real life experiences of H.H Radhanath Swami which also provides wonderful learning. The review is very nicely written. Indeed Radhanath Swami;s memoir is a treat to spiritual aspirants all over the world. Thank you for your wonderful review for the “Journey Home” which has become one of the favourite books to every one who has read it. for sure readers can empathise with Hh Radhanath Swami Maharaj’s spiritual Journey. Thank you for your wonderful comments about the Journey Home book. Well Said Prof.Brigitte on Radhanath Swami’s autobiography ! It will surely encourage many people to read the book & seek Spiritual life in one’ life. This journey of the swami is very inspiring. The journey home is surely most adventurous story of a spiritual seeker in the path of achieving self realization.